The mobile phone is a phenomenon that’s taken over the world. There are nearly a billion phones in circulation and in the UK alone more mobiles have been sold than there are people. It a truly significant technology and the shear number prove how popular they are with us. The number of different models is dizzying with options from video conferencing to email and web browsing. The number of manufacturers grows by the year as companies try to get in on the act. The main reason behind having a mobile phone hasn’t changed though and once you’ve stripped away all the extra features, gadgets and gizmos, they’re still just devices for making and receiving voice data. With the majority of us having a mobile phone nowadays it’s easy to become blasé about how important they are, but they can be an essential business tool or emergency back-up and by far and away the most important aspect of each mobile are the names and numbers that are contained within the phones memory. To those that have a mobile permanently attached to their ears, adding names and numbers might seem like a simple operation, but it’s surprising when you stop and think about how many ways there are to add data to a mobile. The first way is the most obvious. Navigate to your address book and choose New Contact. The phone will then ask you for the relevant details. You can add the number from a received call as well. Simply go to your recent calls list and highlight the number you want to save and there will be an Options or More menu. Once you have opened the menu choose Save Number and the data will be saved to the phone permanently. It doesn’t stop there though as you can also use any numbers sent to you in a text message. 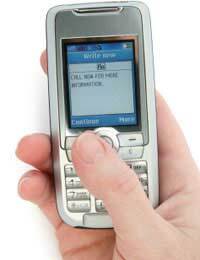 Most modern mobiles can identify a telephone number in a text. When reading a text message simply choose Options or Menu (this may vary on a phone by phone basis)and there will then be the option to Use Number. From here simply save the details as you would normally. That’s not all though as you can simply type the number directly in to the keypad and then rather than calling the number, save it. Again this is done through the Options menu. Adding a name is easy as each key has a sequence of letters attached to it. When you get to the name field in the address book you simply press the number the required number of times to get the corresponding letter. To get a C, for instance, you’d press the 2 key three times. It’s exactly the same as typing a text message. There’s a famous saying in technical support centres that if all else fails invoke the RTIB command. It’s a little used direction but it can save you wasted time and money on technical support. If you’re stuck; Read The Instruction Book (Hence RITB!). It’s certainly true of mobile phones more so than many technical devices. Instructions have come a long way in the last few years and are easier to follow now. If you’re stuck trying to save a number, whip out the instructions and save yourself the stress of trying to work it out manually.